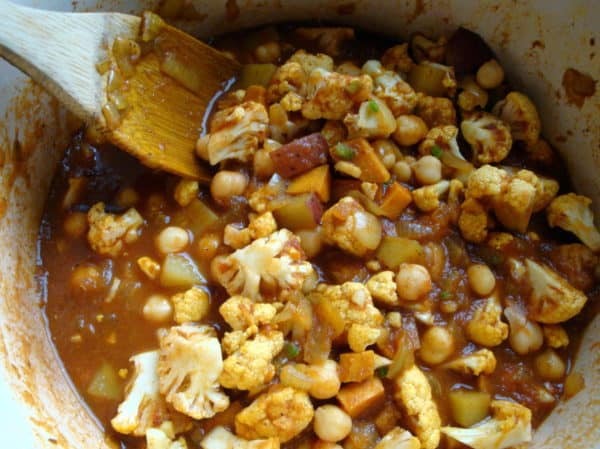 Looking at the catalyst for this Vegetable Curry recipe almost gives me chills. 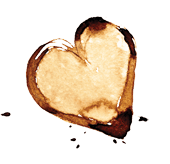 I am really excited to share the heavenly dish that came out of this triple-love spice combo. These spices give vegetable curry a rich, heady flavor. You will never miss the meat. But first, let me share my spice-lust for these stars of Indian cooking. 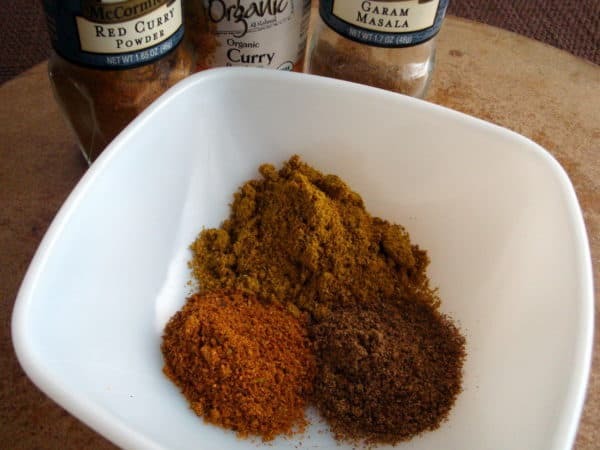 Garam Masala – Just the name tells you it’s going to be impressive. Garam means “hot”, referring to the intensity of the spices rather than capsaicin content that we would normally associate with peppers, etc. Masala simply means “spices”. Garam Masala consists of black and white pepper, cloves, cinnamon, cumin, and cardamom. 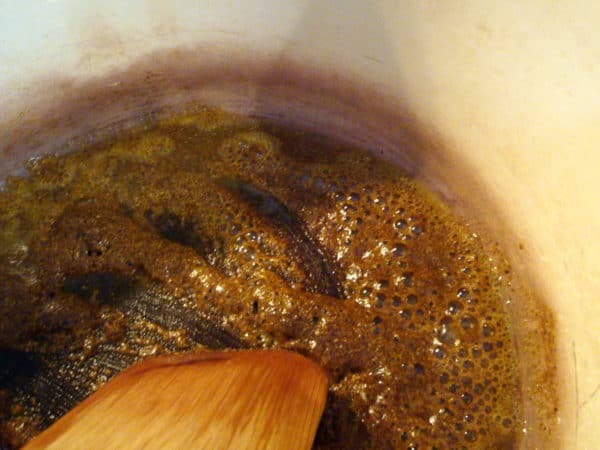 If you have some in your pantry, you might want to go smell it right now. 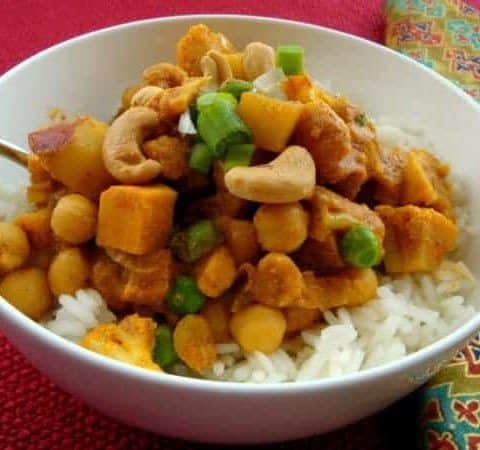 Curry – This recipe calls for “mild” curry powder as well as “red” curry powder. The spice combination in curry includes coriander, turmeric, cumin, fenugreek, red pepper and onion. The red curry will include chili pepper and cardamom. Curry spice combinations may vary some. Let me say here, this recipe MUST have both types of curry. I have made it with only the mild curry and we found it very bland. The amount of red curry called for in the recipe will not make it too hot. If you like your food really spicy, add more red curry and less mild curry. The printable recipe below will walk you through step-by-step, but I’ve included a few of the “key moments” in pictures to help you out. 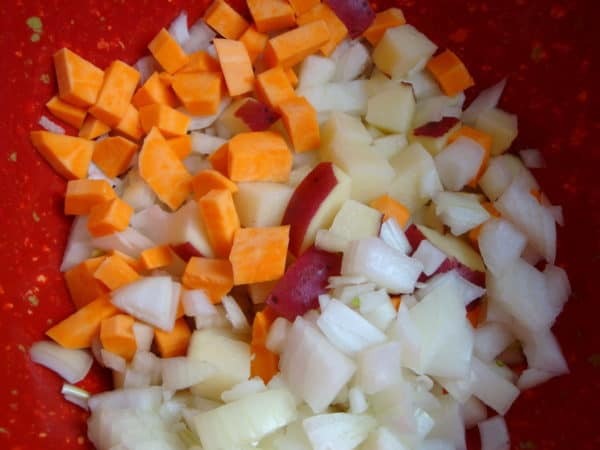 Prep all your vegetables by getting them chopped and ready to add. Don’t combine them all together, however. You will add different groupings at key stages of the cooking time. First you will cook up the spices a bit to bring out their fragrance and just to make your kitchen smell divine. 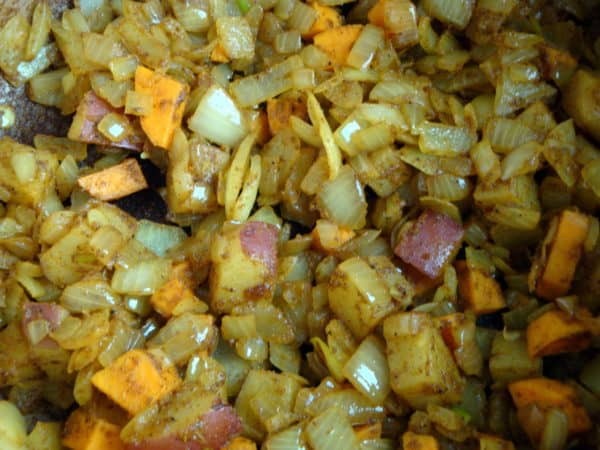 The spices only cook for a few seconds, which is why you want your onions, yam and potatoes ready to go. I’ve just added the vegetables here. Cook on medium-high for 7-8 minutes, until potato and yam are softened. Then you will make a little nest in the center for more oil, and the garlic, ginger, tomato paste, and Serrano chile. After this, add the cauliflower and stir to coat. Add the processed tomatoes, water, chickpeas and salt. Here is the pot of delicious flavors just before they simmer. After you add your peas and yogurt, get your garnishes ready. Plate it over rice if you like. Enjoy! Pulse the tomatoes, with their juice, in a food processor until mostly smooth, about 8 pulses. Heat 2 tablespoons of the oil in a large Dutch oven over medium-high heat until shimmering. Add the curry powders and garam masala, and cook until fragrant, about 10 seconds. 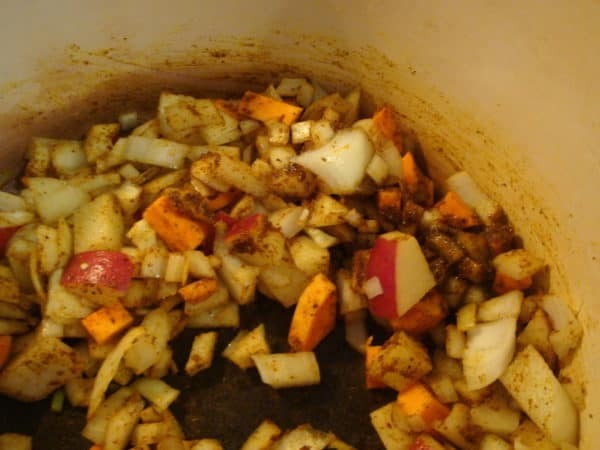 Add the onions, yam and potato and cook, stirring occasionally, until the onions are browned and the vegetables are softened slightly, about 7 minutes. Reduce the heat to medium. Clear the center of the pot, stir in the remaining 1 tablespoon oil, garlic, ginger, tomato paste, and chile, and cook about 30 seconds. Add the cauliflower and cook, stirring occasionally, until the spices coat the florets, about 2 minutes. Stir in the processed tomatoes, water, chickpeas, and 1/2 teaspoon salt, scraping up any browned bits. Bring to a simmer, cover and cook, stirring occasionally, until the vegetables are tender, about 15 minutes. Stir in the peas and continue to cook until heated through, about 2 minutes longer. Off the heat, stir in the yogurt. Serve over rice with cilantro, cashews and green onions for garnish. 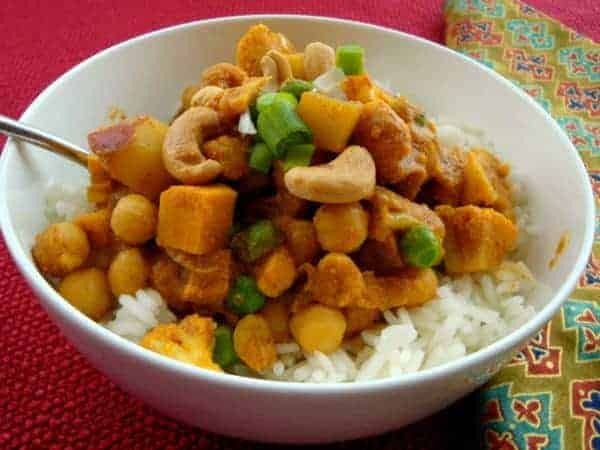 This recipe is a vegetarian or a vegan dish. For the vegan version, coconut cream, coconut milk or coconut yogurt adds a delicious flavor. Adapted from: America’s Test Kitchen Light and Healthy 2010 Cookbook.